For the third year in a row, Infoblox has extended its market leadership in DNS, DHCP, and IPAM, the category known as DDI. That’s just one of the findings that await you in IDC’s latest industry assessment, Worldwide DDI Market Shares, 2017. The report provides objective assessments of the global vendor landscape for advanced DDI solutions. Among its results is that Infoblox now has 51.7% of the global market for DDI and was labeled by IDC as a market leader. Additionally, the report notes that the overall category of DDI is continuing its path of steady growth. Key drivers are the continuing shift toward cloud computing across all areas of IT and the twin imperatives of digital and network transformation. 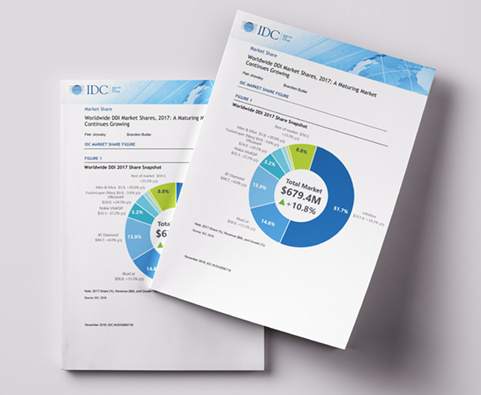 Complete the form on the right to download your free IDC report and see for yourself why Infoblox continues to grow its marketshare in DDI. Complete the form below to instantly download this report.